Mr. Tate will be joining us for a very special luncheon. This will be the day immediately after the election. Who knows what state the Nation will be in on November 9th? It will be interesting to spend this time listening to Stanley Tate. 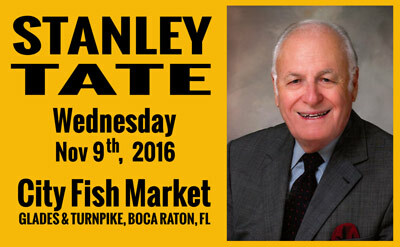 The luncheon is at City Fish Market in Boca Raton, FL. It starts at 11:30. Lunch will be served, and then Mr. Tate will speak. We hope you will join us. Tate uses his influence for the causes he believes in. He passionately supports Israel. In fact, he is the only living founding member of the American Israel Public Affairs Committee (AIPAC), the powerful pro-Israel lobbying group formed in 1954. Tate still sees the GOP as the best hope for the country. He was Miami-Dade co-chair of Mitt Romney’s campaign, and insists that Romney would have become a memorable president by concentrating on the “disastrous” economy.